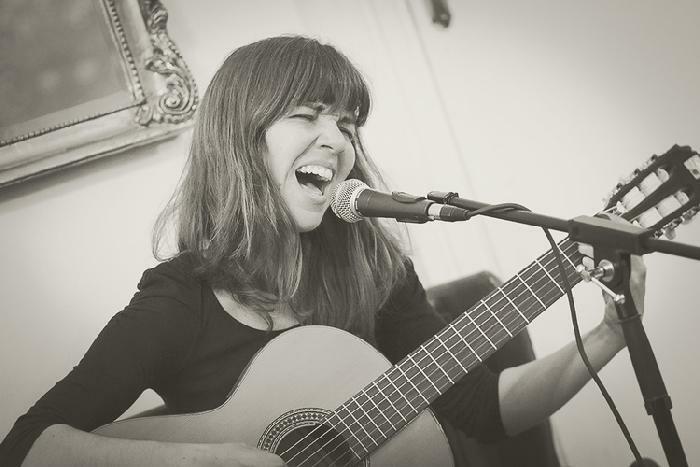 Acoustic concert with Su Garrido Pombo. 6:30pm - 7:30pm. Admission Free. Graduate of the Mayeusis Conservatory, Vigo, (guitar 1992-2000) University of Santiago de Compostela, (Art History 2000-2003) University of Salamanca, (Musicology 2003-2007,) University of Granada, (SENECA Grant 2004-2005.) University of Florence, (Erasmus Grant, 2006-2007). 1999-2003: Member of the Galician folk group Lembranzas touring Galicia, Spain, England, France and Canada. 2003 Formed the group Sonhos, playing Salamanca: The Plaza Mayor, (International Book Festival), Fonseca Hall of the University of Salamanca, Plaza Bandos, (World Ministerial Summit), San Blas auditorium as part of the Salamanca, City of Culture festivities. 2006 toured the Netherlands with Sonhos; Amsterdam, Rotterdam, Middelburg and Den Bosch. 2007 Awarded 2nd place in the MAPFRE Viveparacumplirlo International Music Competition for her song Linda. Also awarded 4th place for her song Extraña María. Also in 2007 awarded 3rd place in GZcrea National Music Competition for her songs Maria and Eu non sei. 2009 performed in the Centre for Women's Studies and the Centre for Brazilian Studies, University of Salamanca, as part of the conference: Chico Buarque: Woman, image, music & poetry. Began collaboration with Edelvives publishers as vocalist on Galician children's literature recordings. Debut album, Sonhos released, played on national radio, including guest performance on 'Discópolis,' Radio 3, Spain. Invited as musical guest to the inaugural Folk Festival, Zamora, October, 2010. September to December, 2013, tour of Mexico with concerts in Mazunte, Oaxaca, Mexico City, Zacatecas International Poetry Festival, Festival of World Cultures, Almoloya, and one month musical residency at La Ceiba Gráfica Artist Residency, Veracruz. 2015 formed group TREME with cellist Margarida Mariño. Awarded Young Galician Musicians for the year 2015-2016 from The Galician Cultural Ministry. 2016 Released debut album Mundo Ideal with guest performance on El Septimo Vicio, Spanish National Radio and The South Wind Blows RTE Radio. Performances in Madrid's Conde Duque Auditorium, La Sala Anecoica (UVIGO), Museo de Arte Contemporaneo A Coruña and throughout Galicia. She is a member of the group Son Trio with pianist and composer k linke and cellist Susanna Blanco The group were finalists in the Martin Codax Music Awards 2018.